Impacts from land-based sources of pollution-- including coastal development, deforestation, agricultural runoff, and oil and chemical spills-- can impede coral growth and reproduction, disrupt overall ecological function, and cause disease and mortality in sensitive species. 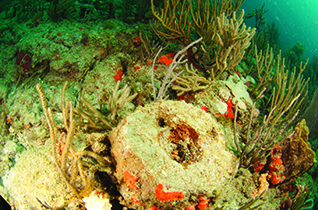 It is now well accepted that many serious coral reef ecosystem stressors originate from land-based sources, most notably toxicants, sediments, and nutrients. Within the U.S., there are numerous locations where coral reef ecosystems are highly impacted by watershed alteration, runoff, and coastal development. 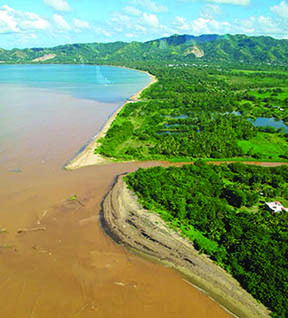 On U.S. islands in the Pacific and Caribbean, significant changes in the drainage basins due to agriculture, deforestation, grazing of feral animals, fires, road building, and urbanization have increased the volume of land-based pollution released to adjacent coral reef ecosystems. Many of these issues are made worse because of the geographic and climatic characteristics found in tropical island areas. Together they create unique management challenges. The importance of identifying the extent and reducing these effects has now become crucial, as land-based pollution and coastal development put coral reef ecosystems around the nation at risk. The NOAA Coral Reef Conservation Program is actively engaged in efforts to mitigate the impacts of land-based pollution on coral reefs. Our scientists teamed with local partners to complete the development of watershed management plans for priority watersheds in our seven U.S. coral reef areas. Now, work is underway to implement effective management practices and support research to grow our understanding of new technologies to reduce land-based sources of pollution. Additionally, we a provide technical assistance to foster institutional partnerships and leverage financial resources to maximize our impact.